This paper reviews and interprets a method for determining the nutritional value of d-amino acids, d-peptides, and amino acid derivatives using a growth assay in mice fed a synthetic all-amino acid diet. A large number of experiments were carried out in which a molar equivalent of the test compound replaced a nutritionally essential amino acid such as l-lysine (l-Lys), l-methionine (l-Met), l-phenylalanine (l-Phe), and l-tryptophan (l-Trp) as well as the semi-essential amino acids l-cysteine (l-Cys) and l-tyrosine (l-Tyr). The results show wide-ranging variations in the biological utilization of test substances. The method is generally applicable to the determination of the biological utilization and safety of any amino acid derivative as a potential nutritional source of the corresponding l-amino acid. Because the organism is forced to use the d-amino acid or amino acid derivative as the sole source of the essential or semi-essential amino acid being replaced, and because a free amino acid diet allows better control of composition, the use of all-amino-acid diets for such determinations may be preferable to protein-based diets. 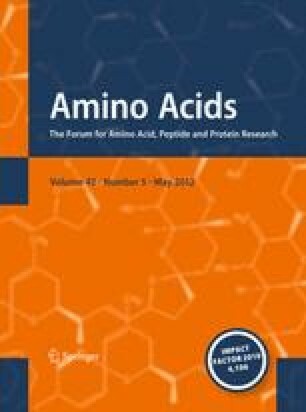 Also covered are brief summaries of the widely scattered literature on dietary and pharmacological aspects of 27 individual d-amino acids, d-peptides, and isomeric amino acid derivatives and suggested research needs in each of these areas. The described results provide a valuable record and resource for further progress on the multifaceted aspects of d-amino acids in food and biological samples.